If you are mentally, physically and emotionally strong, capable and adaptable, you may not even realize that you are stressed. You can have a lot of knowledge about stress and a high tolerance for stressful conditions. If so, you may not be aware of how stress is affecting you below the surface. This is what happened to me. I taught stress management for 25 years and thought I had my own stress well under control. When, the day came that I couldn't go on, I was shocked. "How could this happen to me?" I sat on the sofa with a cover over my head, not wanting to see or talk to anyone. My mind and body shouted "No More!" Check in with your body ~ Is there any dis-ease? 90% of all physician visits are stress related according to the CDC. Check in with your mind ~ Do you just rise above stressful situations or sweep things under the carpet to keep an even keel? Check in with your emotions ~ Do you feel numb to the ups and downs of life experiences? Check in with your spirit ~ Are you just going through the same routine every day like "Goundhog Day?" Stress robs you of energy and passion to live each unique moment fully. Check in with your relationships ~ Are you tolerating and accomodating people who push your buttons to be a "good" person? Do you feel like you help everyone else and no one is there for you when you need help? If you answered "yes" to any of these questions, it's time to become more aware of your stress and take action. 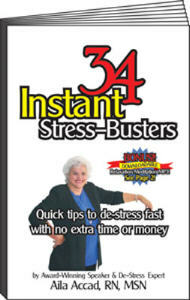 "34 Instant Stress-Busters" provides simple actions to reduce stress in each of these areas. You must be aware of your stress before you can release it! Introduction and Advanced EFT Workshops in June! "The stress releasing techniques are still being practiced by all of us. Your seminar helped us bond as a team. We can share experiences and enjoy the day more." I use this Journaling Method and am happy to endorse Jane Martin's Workshop. Check it out! I love to hear from you! Please share your questions ideas and successes with me! If you Like this Newsletter, pass it on to your friends!